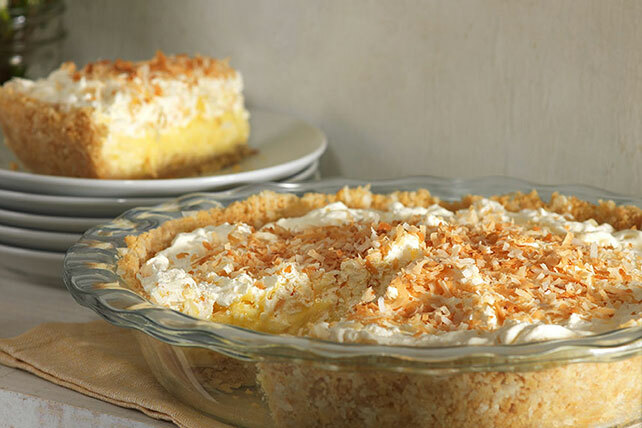 Bananas, pineapples and coconut add tropical flavors to this luscious cream pie. It's perfection in a shortbread cookie crumb crust. Mix cookie crumbs, 2/3 cup untoasted coconut and butter in medium bowl until blended; press onto bottom and up side of 9-inch pie plate. Bake 10 min. or until golden brown. Cool. Beat pudding mix and milk in large bowl with whisk 2 min. Stir in remaining untoasted coconut. Arrange banana slices on bottom of crust; cover with pudding mixture. Gently stir pineapple into COOL WHIP; spread over pudding layer. Sprinkle with toasted coconut. Balance your food choices throughout the day so you can enjoy a serving of this creamy pie. Spread coconut into thin layer on bottom of shallow pan. Bake in 350°F oven 7 to 12 min. or until lightly browned, stirring occasionally.